For many, the digital world offers an exciting blend of innovative business opportunities, improved services and global connectedness. There’s a dark side, however, where personal data gets stolen and sold, identities are used to commit fraud and all kinds of evil things are available for purchase. The same opportunities – both positive and negative – are freely and abundantly available online to our children. On the positive side, our children will learn faster, adopt technologies quicker and make friends all over the globe. On the negative side, they can be subjected to online bullying and shaming, influenced or groomed by criminals and they can be exposed to things not suitable for their age. Parents and educators understand the importance of teaching a child emotional intelligence or EQ. This helps them engage successfully with other humans in the real world. But nowadays, kids grow up looking at screens more than at faces; speaking to virtual friends as often as real ones and buying goods and services online rather than in-store. 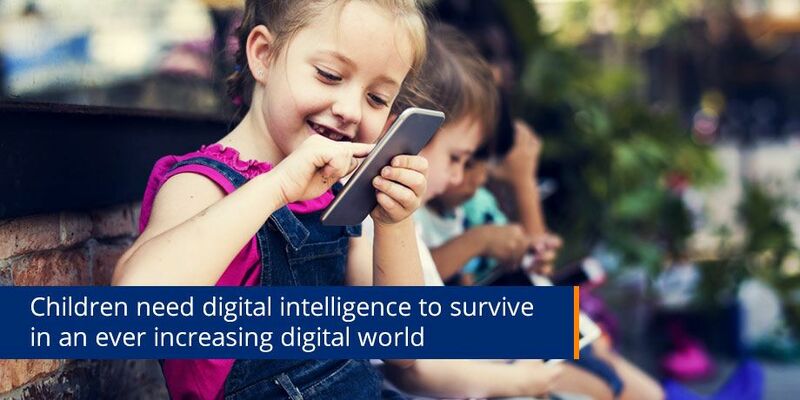 Helping today’s children develop digital intelligence (DQ) – social, emotional and cognitive abilities – is vitally important to prepare them to face the challenges, risks and demands of the digital world. Developing DQ is about giving children the right knowledge, skills, attitude and values to be upstanding and functional digital citizens. This involves being able to discern right from wrong, true from false and good from harmful in the online world. Mastering these aspects will help children understand the value of their digital identity, exercise their rights as a digital citizen and ensure their own safety and security in order to be less vulnerable to online risks. The DQ Institute offers a self-learning course for children to learn about digital citizenry. Parents can enroll their children on DQWorld.net and they can work through the program at their own pace. It is recommended that parents set designated times for learning and engage with the child regularly for course feedback. A fun activity workbook is also available which can be used to reinforce the principles learned. Many schools are using technology such as email and the Web on tablets or computers to deliver lessons, but have not yet incorporated digital intelligence into the syllabus. This may be due to a lack of awareness around digital intelligence or a lack of suitable material and support on the topic. The DQ institute and others like them have developed teaching materials to assist educators in introducing these skills. A teacher’s guide is available, which provides full details of the DQ curriculum and how to implement the DQ program in the classroom. It can also be introduced as a school-wide program, which will allow schools to generate a personalized DQ Report for each student, subscribe to DQ Workbooks for students and expose teachers to the DQ Educators Training. Although a high DQ will benefit all digital citizens, the emphasis needs to be on giving the children of today a good DQ foundation before letting them loose in the digital world. Each generation will be entering an increasingly digital world and we have to prepare them to succeed as digital citizens. The challenge is to also ensure that children develop the human values of respect, empathy, prudence and integrity that will enable them to thrive online.